Containing Gilbert Foliot's 'Commentary on the Song of Solomon', this early 13th-century manuscript has additional writings and inscriptions that connect it with Rochester, where it was part of the library, and with Hereford, where Gilbert was bishop before becoming Bishop of London in 1163. Gilbert Foliot is more well-known for his support of Henry II in his dispute with Thomas, Archbishop of Canterbury. An inscription near the beginning of the manuscript says that it belonged to the cloister of Rochester. 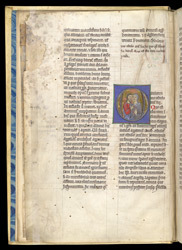 Following a letter dedicating the book to Robert, Bishop of Hereford, Gilbert's commentary begins in the second column with its first letter enlarged and historiated (bearing a picture) with a picture of Christ and a female figure who appears to be a nun, as she does not have a halo, which would identify her as the Virgin Mary or a female saint.